January Journal: Day 12 — Ginger writes. I attended a business meeting at the kids' school this past Tuesday night, and although I was reluctant to go, I came away from the time entirely blessed and encouraged. I am so thankful for the University School Model* we get to be a part of and for the leadership of this particular school. What is our goal / end / finish line / target? What would we have our children become? What would we have this community become? And sharing quotes like these: "What was once outside becomes inside." "The better person you are, the better leader you are." "If you can't think, that's a terrible way to live." Moving forward, I am going to remind myself that some of the money we pay for this specialized education is money spent on developing me as a person, a leader, and a co-teacher. In retrospect, I am certain that if there had been a fee at the door, I would have gladly given good money for the type of encouragement, inspiration, and calling to higher things that we received Tuesday night. I came home with a renewed desire to further my own education and ability to think and grow. 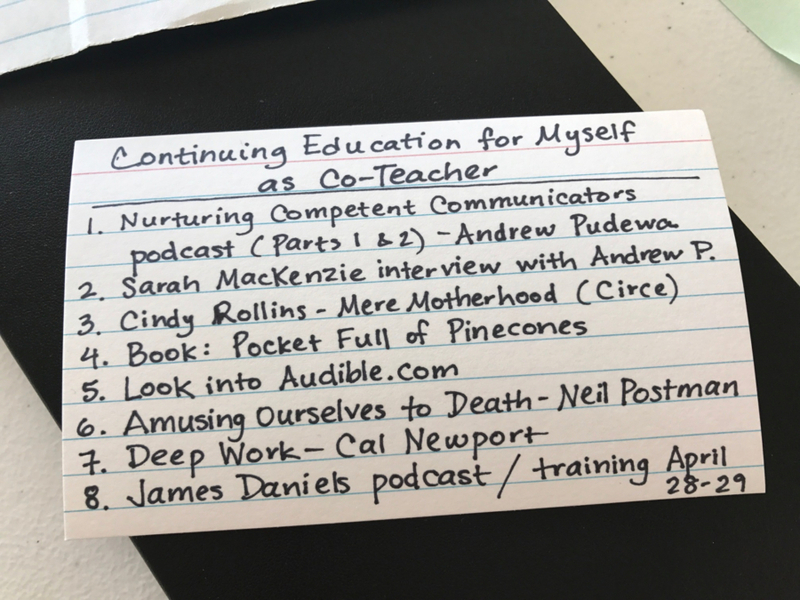 Based on recommendations from the meeting and from others in my school circle, I made a list this morning of specific ways to listen, read, learn, grow, and become. I may not do it all, but I will do something. I have these years of my life to live this list, these children with whom to grow alongside, this school community to support our endeavors, and these teachers/writers/thinkers to guide me so that "what was once outside becomes inside." My heart is full and will be fuller still. If you have other resources to recommend I add to my list, please comment and let me know. If you're local to Greenville and want to know more about our school, please comment and I will be in touch. *A University Model School is one in which students attend school 2-3 days per week in a traditional classroom setting and are homeschooled on the remaining days, taught by the parent who is designated as the "co-teacher." Our particular UMS school uses a Classical Model of learning. More info here.